I run Ubuntu 16.04 on an Acer Aspire E5-773G notebook. Unfortunately, I can not use my brightness function keys on the login screen, so the first moment when I am able to change my screen backlight brightness is after successfully entering my password and logging in. Modifying brightness according to these rules should only take place during boot or optionally when waking up from suspend. It may not automatically change brightness while I'm working. Pay attention to quoted values and commas. First column with quoted values represents hour range in 24 hour format, the second column is percentage. For example, if you booted from 5 to 7 o'clock your brightness would be set to 25 percent. If you booted from 8 to 16 o'clock, it would be 50 percent. Set greeter-setup-script=/opt/set_timed_brightness.py in the /etc/lightdm/lightdm.conf file. The greeter setup script runs as root and once your system gets up to the login screen, the script will run and set the brightness you need. Remember: all the standard rules apply, the scripts must be made executable with chmod +x, naming and calls to each file have to be consistent. After sunrise transition is complete, eyesome daemon sleeps many hours until sunrise transition starts. 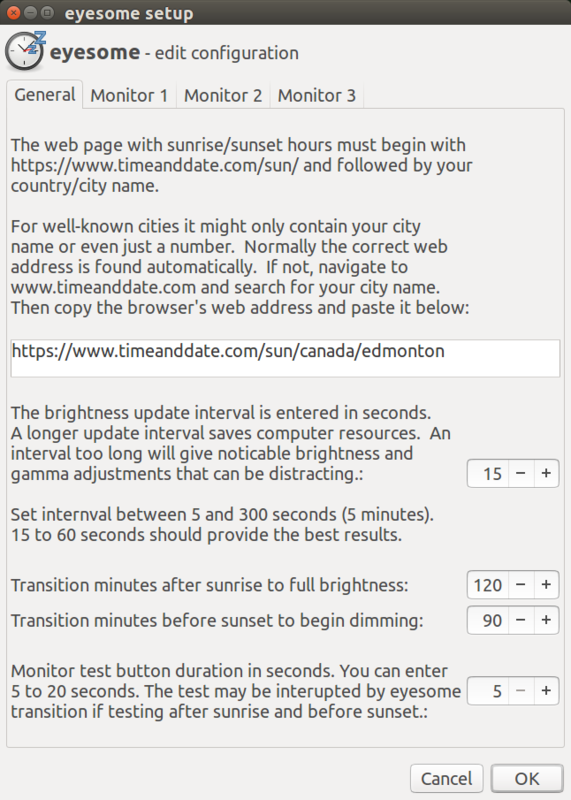 I'm using 90 minutes before sunrise but you can set any period you like. Inversely to sunrise transition, the sunset transition gradually decreases screen brightness (and optionally gamma too) so it is unnoticeable. Note that during nighttime transition gamma may be defined to increase. For example Red gamma may be defined as 1.0 during day and 1.2 during night to reduce eye strain. Blue gamma in turn may be defined as 1.0 during day and .8 during night so it will decrease instead. To reduce resources, eyesome sleeps the entire period between sunset and sunrise. Depending on where you live and the season of the year, the average sleep will be 12 hours. When you click the Edit button from the main menu the edit configuration general tab initially appears as shown below. Your country/city name should automatically appear. If necessary you can override it. Don't be daunted by these settings they are for the most part automatically obtained by eyesome. You will need to set the daytime and night brightness/levels though. Monitor 2 Tab is not shown because it is a new TV with adaptive brightness and Smart OS. It requires no overrides by Eyesome. 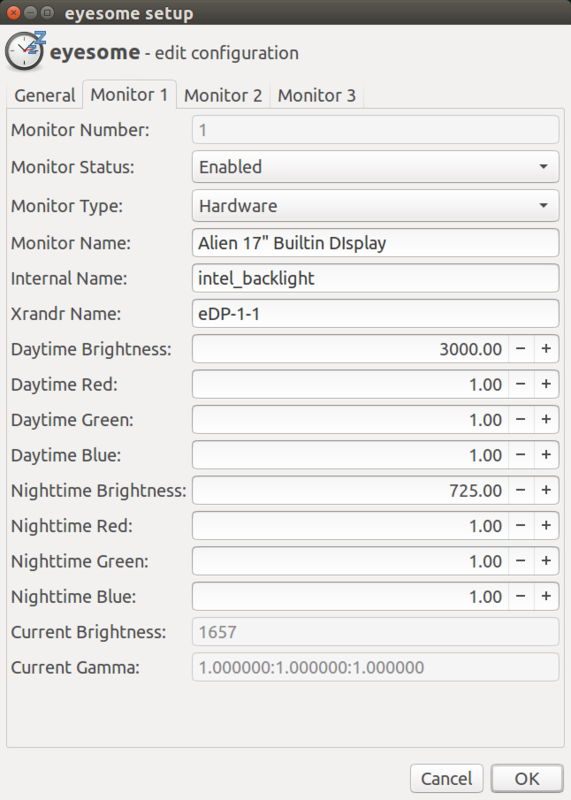 If after eyesome is installed you attach a different monitor to your system you may have to enter the xrandr monitor name. 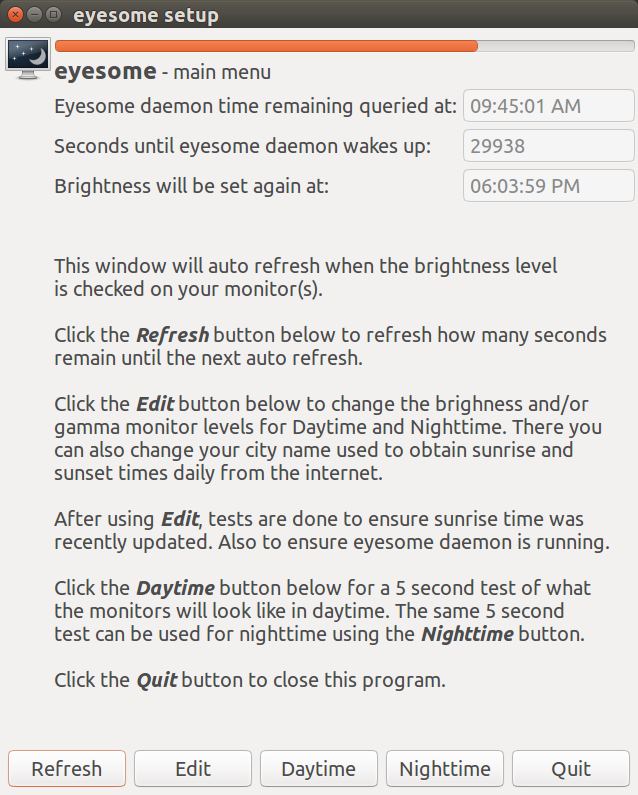 From the main menu you can test your daytime and nighttime brightness and gamma settings for 5 seconds by clicking the Daytime and Nighttime buttons respectively. You can change the duration of the test from 5 seconds up to 20 seconds from the Edit Configuration - General Tab. Assume you suspend your laptop when it's morning before work and the screen is at full dim. You come home after work when the sun is high in the sky and open your laptop. The screen is so dim you can't read it. /etc/systemd/system-sleep/systemd-wake-eyesome control file is called whenever the system suspends or resumes. The control file calls the bash script /usr/local/bin/wake-eyesome.sh to reset brightness to full and then sleep until sunset transition. You are watching a movie on your external TV at night and close your laptop lid for better viewing. 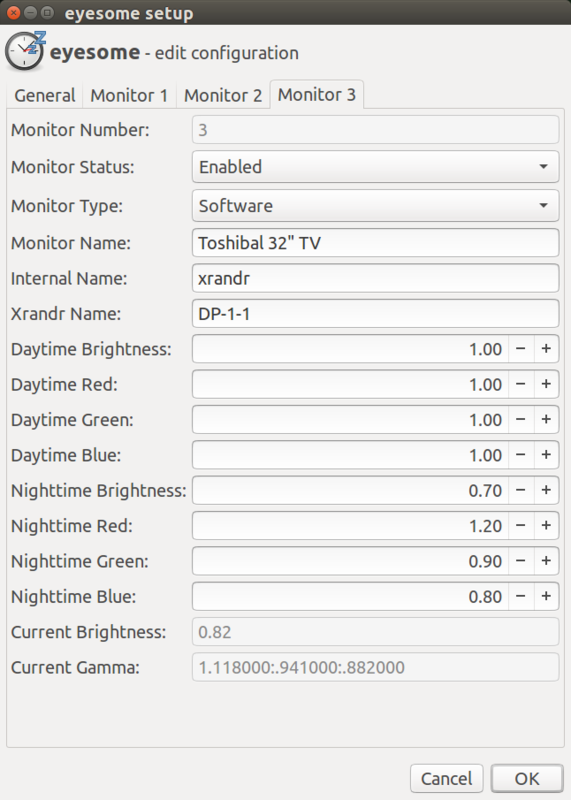 Ubuntu / Lightdm / xrandr takes a few seconds and then resets your external TV to full full brightness. OUCH to your eyes. /etc/acpi/event/lid-event-eyesome control file is called whenever the laptop lid is opened or closed. The control file calls the bash script /etc/acpi/acpi-lid-eyesome.sh to handle the lid opening and closing. In turn the eyesome bash script calls /usr/local/bin/wake-eyesome.sh to reset brightness for nighttive viewing and then sleeps until sunset transition. This answer is almost two years to the day after the question was posted. There was an early version of this answer deleted in February 2017 which I've just undeleted and revised. This program was just released in September 2018 so please let me know if you find any problems or have suggestions for improvement. The documentation phase is just starting so don't hesitate to ask any questions. Your questions may even result in documentation improvements. Not the answer you're looking for? Browse other questions tagged boot laptop brightness backlight or ask your own question. How to change brightness before logging in?